All transactions are safe and secure with a reliable history in online purchasing behind each of our associates. 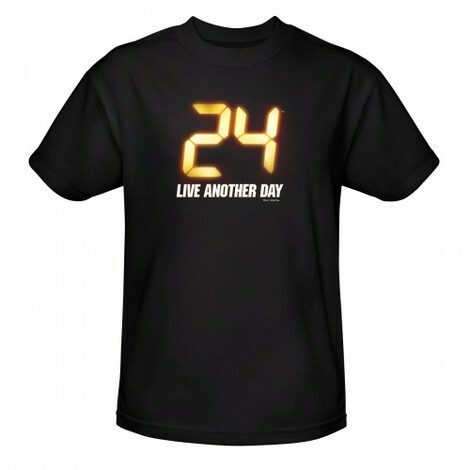 Buy the 24 Number t-shirt to own 24 clothing and merchandise. This stylish dark 24 t-shirt features a glowing number "24" on the front. The digital font in the design is the official 24 tv show's logo font. The tee is made from 100% pre-shrunk cotton with a vintage look and feel. It looks great with either jeans or shorts and is perfect for a daylong FOX Twenty-Four marathon. Let everyone know that as a CTU Agent, you're trained to extract sensitive information, even from your friends. In addition to the 24 Number tee above, browse the 24 Clothing Gallery for more apparel like men's and women's clothes, kids shirts or hoodies.